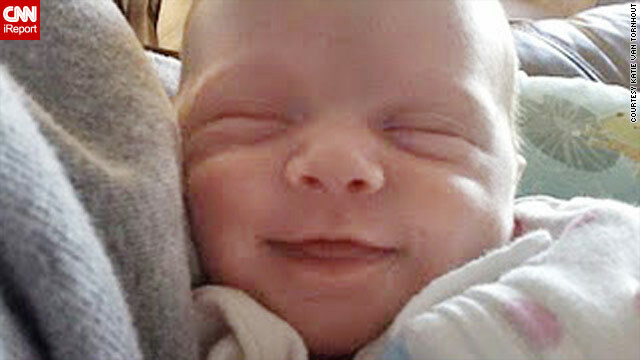 Callie Grace Van Tornhout died five weeks after her birth, leaving her parents grief-stricken. (CNN) -- Merely 10 weeks after losing her newborn, Katie Van Tornhout learned she was pregnant again. "I freaked out," she said. "I cried. I didn't want this to happen. ... We almost wished to have a miscarriage. We felt it wasn't right to have this baby." Van Tornhout and her husband were mourning the loss of their 5-week old girl, Callie, to whooping cough. Still stunned from her death in January, her parents had no immediate intention to conceive again. Feeling shocked and unprepared, Van Tornhout also worried that other people would think her pregnancy was to forget or replace Callie. "You can never replace a child, whether they're here for six minutes or 16 years," Van Tornhout said. "People think you can get another one. It's not the same." This concept, described as a "replacement child" in psychology, is when grieving parents attempt to assuage their loss by having another offspring, whether through pregnancy or adoption. Having another child after a loss can bring new joys, but it's not a matter of "replacing the loss" and "getting a new one," say mental health experts. "The idea of replacement -- that people are replaceable like lightbulbs -- it's a devastating myth," said Russell Friedman, executive director of Grief Recovery Institute, which provides recovery training. "Is it OK to have other children? Yes. Is it always the smartest to do right away? No. The truth is you have to grieve the children who died." This topic surfaced when actor John Travolta and his wife, Kelly Preston, announced on their website last week that they are expecting a baby. Preston's pregnancy comes just over a year after the death of their son, 16-year-old Jett Travolta. Jett died after suffering a seizure in the Bahamas in January 2009. Mental health experts say it's not a matter of time, but the parents' ability to cope with the loss and prepare to raise another child. The sting of death never fades, but having another child could also bring healing. "There's so much joy in having another child -- the distraction and joy is a good combination to deal with the pain," said Rama Ronen, a clinical psychologist in private practice who has researched how mothers grieve the loss of a child. Callie Grace Van Tornhout was born prematurely on Christmas Eve 2009 and stayed in the neonatal intensive care unit for 12 days. When she came to her South Bend, Indiana, home, she thrived, giggled and grew into a feisty infant. Katie and Craig Van Tornhout are expecting their second child on Christmas. At a month old, she started coughing. Her parents took her to the doctor's office. She became pale and lethargic, and eventually stopped breathing. She died from respiratory failure, caused by whooping cough. She was five weeks old, too young to be vaccinated. Van Tornhout and her husband, Craig, cry when they pass Callie's room in the house. They left her nursery the same, her pink clothes still folded in the closet. She is due to give birth on Christmas. 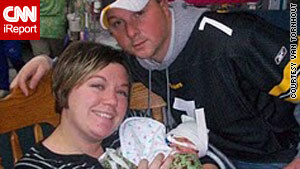 They had not expected another pregnancy because they had struggled to conceive for five years before Callie's birth. "It felt like this is supposed to happen," Van Tornhout said of her current pregnancy. "We're not giddy, but accepting it more." "It's a gift from her," she said about Callie. "When you're not trying, it's even more special. It's part of life. It's their gift. It's bittersweet. You want to grieve for the other child, and yet, there's a sense of this is her gift. It's kind of overwhelming." "You can add to a family, and it's never a replacement. It's a younger sibling for the child you lost," she said. When parents are not mentally prepared for another child, it could cause many problems, said health experts. Parents should ask themselves: "Are they having a child only to replace the child that's lost? Or are they genuinely interested in another child?" said Dr. Arnold Richards, a psychoanalyst. "Because if it's only for a replacement child, that's going to place a very heavy burden on the psyche of both the parent and the new child." Judy Mandel, a self-described "replacement child," had an uneasy upbringing. She felt her parents' grief and subtle comparisons to her dead sister throughout her life. Her parents rarely spoke about Donna, who died at age 7 when a plane crashed into their New Jersey home in 1952. Two years after, her parents decided to have another child, after her mother got advice from a doctor that another child might alleviate her depression. It's their gift. It's bittersweet. You want to grieve for the other child, and yet, there's a sense of this is her gift. Her parents often dressed Mandel in the same clothing style and the same haircut as her deceased sister. "This sister was the angel sister," said Mandel, author of the memoir "Replacement Child." "It was almost like a legend. There's the aspect of being in the shadow of that. You can't live up to that promise the child had. I was always told what a special child she was, how promising she was in school, how perfect she was -- it's tough. I was thinking I can't be as good as that." This often happens to families who haven't properly grieved. "If you have another child, wouldn't you want that child to have the privilege of having his or her own unique personality and not be confused with the child who died?" Friedman said. "Wouldn't that give honor or dignity to the child? We need to be able to do that. We can't do that until we're emotionally complete with the child who died." While her sister had been girlish, Mandel sought to distinguish herself. She was a tomboy, climbing trees, playing sports and rebelling. The fear of loss never left her father. "I would get stories all the time about how things can happen," she said. "They'd read the newspaper and say, 'Look what happened to this guy. The scaffolding fell on him.' I'd be warned every time how dangerous it is." Parents who have lost a child may smother their next one because they're scared of another loss, said Friedman. Mandel recommended that parents who have experienced loss talk openly about the deceased sibling, but not to romanticize him or her and subject their living children to impossibly high comparisons. At the same time, her presence seemed to be therapeutic for her parents, Mandel said. "It gave them a normalcy in the family," she said. "They looked to me for that piece of normal family. Especially for my mother, it filled a hole for her in having a new baby and new hope in the house."